With almost 900 square feet of glass to cover, installers had to build extensive scaffolding to reach the three-story-high windows. The homes two large flying gables top a three-story wall of glass, creating unique rooflines that spark tremendous visual interest from behind the property. But while the windows added appeal to the home, they were also a source of intense heat and glare by allowing the suns rays to pour in. In addition, UV light also threatened to damage the furnishings and decor. The homeowners looked for a solution in the Yellow Pages and selected RGJ Systems, Inc. of Dayton, Ohio because they were a 3M-authorized Dealer / Applicator. "We visited the home, surveyed the situation, and showed them our window film samples," said RGJ Systems owner, Richard Jennings. "They liked the colors we had to offer and we were able to find one that met all of their needs." Jennings crew used RE50NEARL Scotchtint window film, because it blocks up to 43% of the suns heat without causing a noticeable difference in the appearance of the windows. With almost 900 square feet of glass to cover, installers had to build extensive scaffolding to reach the three-story-high windows. Jennings two-person crew completed the project in two days. Just two months after the installation, the homeowners said they were pleased with the tremendous glare and heat reduction and were thankful for the added protection to their furnishings and decor. "The owners had heard about 3M products and their excellent reputation," Jennings said. 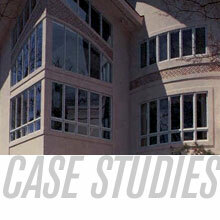 "I think they were impressed with the quality and consistency of the 3M product. And the lifetime warranty shows that 3M is able to stand behind its products. When they checked our companys references, I think it proved to them that we were the right choice for the job."